Whoops, long time since an update, and a lot has happened in the last 14 months, so this will be broken up in to multiple posts for everyones (including mine) sanity. 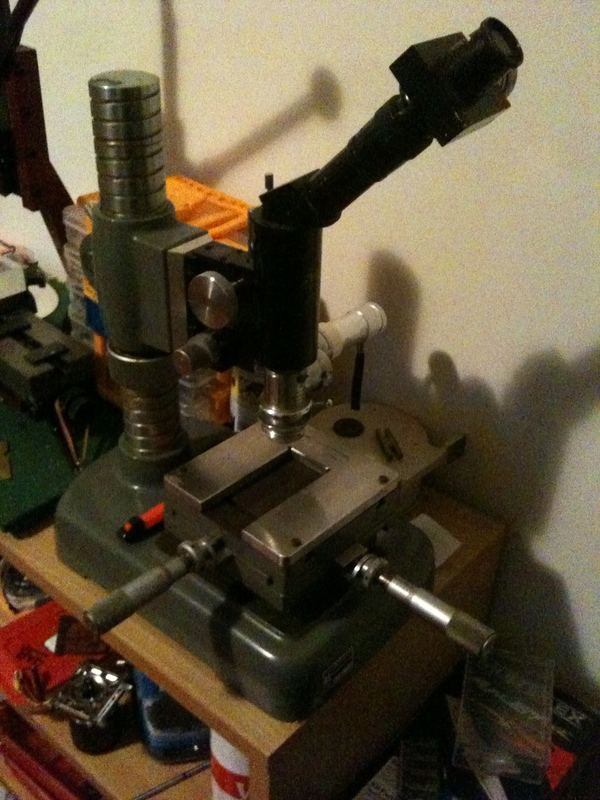 I succeeded in procuring my toolmakers microscope, with it arriving shortly before Christmas 2009, the only issues I have with it after a number of uses, are that it measures in imperial increments, so conversion to metric is needed, and due to the number of measurements needed, the opportunity for errors is increased, also it has only the one set of optics, and the magnification is possibly a little excessive. With a new direction comes additional complications (pun intended), when designing a movement from the beginning, all of the dimensions of wheels, pinions etc are arbitrary, in that if it looks good and is mathematically right then it should work, if not then you can adjust dimensions and try again. To use parts from an existing calibre requires measurement of each component that is going to be used, as well as the measurements between components eg the distances between centres of each train wheel, escapement parts etc. In the normal course of my work I had acquired a variety of equipment, but nothing that would be accurate enough to transfer components from one movement to another. I had been advised (again by Peter Speake-Marin) that an optical comparator was used to derive the measurements that I would require, funnily enough there isn’t one sitting in my workshop, so shopping I would go. I have managed to derive the location of an optical comparator relatively nearby, but along with most things I require lack the finances needed to acquire it. 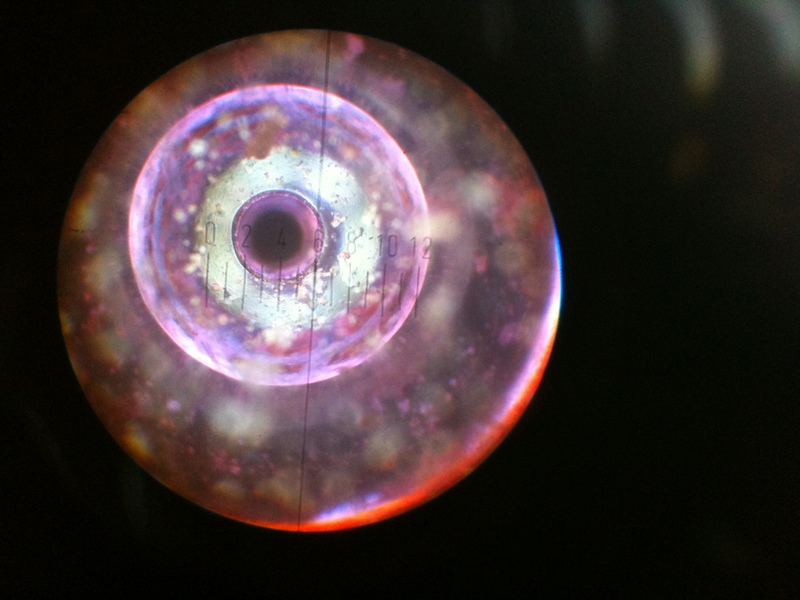 In a discussion in the workshop I was told that a toolmakers microscope may fit the requirements I have. Back to shopping again, I have sourced and paid for a Leitz toolmakers microscope that will be arriving in approximately 8 weeks from Canada. Once this arrives I will add pictures of the process used to transfer the components, and any modifications to the components that I will have to make. So, what criteria should I use to be the heart and circulatory system for my prototype movement? Luckily I had had thoughts on this while designing a custom train over the previous years and worked out the following.. The donor movements have to be readily available for a reasonable price, and be uniform in production. Unfortunately this rules out some brilliant movements by itself, I would love to use the Omega 30mm series, but trying to buy more than one in good enough condition is hard enough.. 5 or so that i expect to use, not likely! This also rules out some nice vintage calibres, early Jaeger, Piguet etc.. Due to cost, hopefully in the future I’ll be in a position to revisit this as a new project ala Kari Voutilainen and his Longines’ if I can find a suitable movement. The movement components must be similar in dimensions to the movement I plan to make, as this will reduce my re-work time, hopefully by a considerable amount and will also simulate the pressures on components. The movement components should be of good quality, in both materials and production. In my time at the bench I have seen watches disintegrate from within after one or two years of wear, when they have been made from inferior materials, which have worn out and then increased wear in additional components and so on. On the opposite side I have worked on watches that have been running for 20 years or more without maintenance and require little replacement or repair of parts. With this criteria, and especially with a restriction on the amount I can invest financially, there is one stand out movement. The Unitas / ETA 6497/6498, used by a remarkable variety of watchmaking firms, from house branded pocket watches to highly decorated versions in Omegas, Panerais and such. Used for almost 60 years, while still evolving with new technologies, Nivarox balance spring, Incabloc shock absorption, Glucydur balance, all of these technologies have been added as they have come about, but the basic movement has remained the same. The movement is definitely robust, for the cost is quite impressively kitted out, and has numerous modules manufactured to give it additional functionality. While I have worked on these movements before I currently do not have one in my posession, so will be waiting to obtain some to continue my project, as well as waiting on some tooling to measure components also (see next post). I am using a Sherline CNC mill, which while not the most accurate machine in the world, will I hope be suitable for my purposes.. This movement as designed uses a co-axial extra flat escapment, which will be re-designed to use the normal execution of the co-axial escapement as designed by George Daniels or a standard swiss lever escapement. The movement as designed also uses a key-wind, key-set mechanism to remove any machining of the mainplate from the sides, due to limitations of my tooling and skills (This may change as i gather more skills). I also have considered the idea of PVD black plates with blue sapphire jewels, which I quite like the look of. To be perfectly honest it’s probably a silly idea to want to make a watch from start to finish, but I’m a contrary type of person. If it was easy to do then everyone would be doing it, and while I like the easy way as much as the next person, I feel that this could be my “thing” that people know me for.. I will also be changing the design of my movement to use the standard co-axial escapement as designed by Dr George Daniels, as opposed to the extra-flat version (also designed by Dr George Daniels) or for at least the first finished movement i may use a standard Swiss lever escapement. As I now have to re-set out my movement from the start before returning to my original plan, I can show the progress as I go, unfortunately it also brings it’s own problems.. First off, which gear train to use? How to convert the train to my design? and most important… Would it look good?